It's not usually a good idea (for me) to be reading three novels at once, but in the case of my past week's reading, it has been interesting to see similarities in Ben Pastor's Liar Moon, James McClure's The Sunday Hangman, and Valerio Varesi's The Dark Valley (translated by Joseph Farrell from the Italian original, Le Ombre di Montelupo). 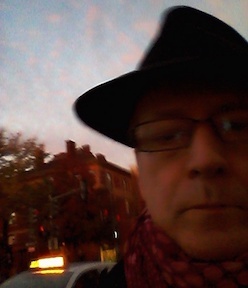 Not that the three books are much alike in plot, characterization, or the crimes portrayed. What they share is that they all progress by means of dialogue. 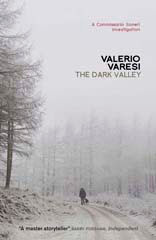 In the cases of Varesi and Pastor, the effect is rather melancholy, but in McClure's book it is oddly comic. Varesi's book even gives the reader a dramatic climax in terms of second-hand conversation (it's an interesting effect), and most of the rest of the book is converstations among Commissario Soneri, a captain and a Maresciallo of the Carabinieri, and various inhabitants of a small town in the mountains near Parma. Varesi's first novel to be translated, River of Shadows, shares a similar approach, and each novel is embedded in a group aging men and in the politics of the conflict between partisans and fascists at the end of World War II (portrayed more subtly and to better effect than the war reminiscences of Marco Vichi's Inspector Bordelli, though, in my opinion). The only women in The Dark Valley are Soneri's girlfriend Angela (who's rather more sympathetic a character here than in the first book) and a woman who, with her husband, runs the small inn where Soneri has taken refuge from the city. The result is a rather one-sided buzz of conversation and gossip that is nevertheless interesting for its gender limitation. The solitary walk in the woods of the book's cover is a true portrait of the book in one way, but gives an ideal rather than an actual sense of what the book is about and how it progresses. Soneri falls into the crimes associated with the failure of a mountain town's main source of jobs and income, a salame factory where in fact Soneri's father was once employed as a bookkeeper. Soneri's memories of his father become entwined (as well as reconsidered) with what is going on as the whole town faces collapse. The denouement is very interesting in the way it is revealed, through conversation that holds the horrifying nature of the central crime somewhat at arm's length and therefore more bearable. 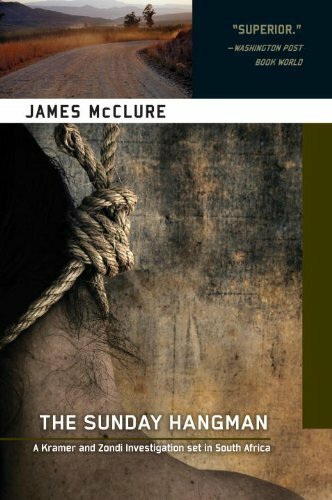 McClure's Sunday Hangman (the most recent of his novels being brought back into print by SoHo Crime) portrays a closed world as well, but one that is so jarring that it's almost like reading science fiction. The racism and cultural violence of the apartheid era in South Africa is assumed, given to the reader in all its nastiness with no respite or commentary. McClure's contemporaries understood the satirical and critical import of his style of writing very well, though readers today may have some difficulty getting past the race-hatred (and fear) embodied in the characters' language and behavior. The style of writing is also a bit indirect, relying on dialogue and a narrative that reads almost like dialogue, with much unspoken and hinted at rather than given directly. But the rewards of persisting with McClure's Tromp and Zondie books (the former being an Afrikaan's lieutenant and the latter a Zulu sergeant in the South African Police) are considerable not to mention the historical value of getting such a direct portrait of life in that era. And not to mention the considerable humor, not least in the relationship of the two main characters, constantly struggling across cultural and racial barriers internalized by them both. In Hangman, the plot is also very oblique and odd. A criminal on the run after a bank robbery in which Zondi was shot in the leg (and is still suffering from the wound) seems to have hanged himself along the road. But the medical examiner and Tromp think it was murder. The investigation winds around and around until it reaches a bizarre (but in the context o McClure's story, entirely believable) conclusion. Ben Pastor, who is an Italian woman writing in English about a German World War II officer called upon to investigate crimes as well as to conduct his part in the war. 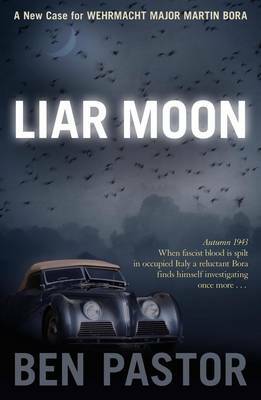 Much of the conversation in this second "Martin Bora" novel is between the now-Major Bora and an Italian policeman, Guidi, pulled together to investigate the murder of a local plutocrat in Verona in late 1943. Bora seems at times like the German officer played by Erich von Stroheim in Jean Renoir's wonderful Grand Illusion: as the film progresses, von Stroheim has lost more and more body parts, until he's practically a cyborg. Bora has, just before the novel begins, been the victim of a partisan bomb and has lost a hand and almost lost a leg. The quality of the dialogue in the book forces us to see Bora as a person, rather than a Nazi stereotype, in spite of his stiff German attitude and the willingness with which he seems to support atrocities perpetrated by his army. As the novel progresses we learn a bit more about his role in the atrocities that may (as the series progresses) change how we see Bora (there was little hint of any mitigation in the first Bora novel, Lumen. Bora is somehow both unlikable and sympathetic, and it will be interesting to see how he develops as a character through what is characterized as an ongoing series. Liar Moon, considered on its own, is a very interesting and unconventional portrait of a complex era of italian history (now that Bora has been sent to northern Italy after the Polish setting of Lumen), and the conclusion, reached after much digression in action and conversation, includes an interesting double-reverse and depends on the correct interpretation of the book's title, whose basis in folklore is finally explained. I would have said that reading three novels based on indirect conversations rather than narration and action would have been frustrating and confusing--but Pastor, Varesi, and McClure are in their very different ways very good writers, and their tales are rewarding whether considered together or separately.